Recently, there is a surge of research on aspect mining, where the goal is to predict aspect ratings of shops with reviews and overall ratings. Traditional methods assumed that aspect ratings in a specific review text are of the same level, which equal to the corresponding overall rating. However, recent research reveals a different phenomenon: there is an obvious rating bias between aspect ratings and overall ratings. Moreover, these methods usually analyze aspect ratings of reviews with topic models at textual level, while totally ignore potentially structural information among multiple entities (users, shops, reviews), which can be captured by a Heterogeneous Information Network (HIN). 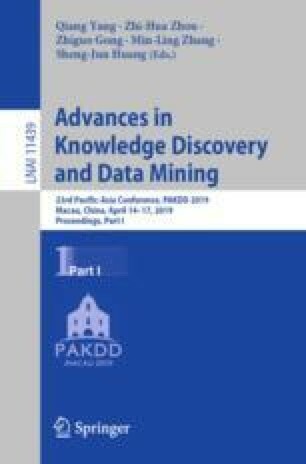 In this paper, we present a novel model integrating Topic model and HIN for Aspect Mining with rating bias (called THAM). Firstly, a phrase-level LDA model is designed to extract topic distributions of reviews by using textual information. Secondly, making full use of structural information, we constructs a topic propagation network, and propagate topic distributions in this heterogeneous network. Finally, by setting review as the sharing factor, the two parts are integrated into a uniform optimization framework. Experimental results on two real datasets demonstrate that THAM achieves significant performance improvement, compared to the state of the arts. This work is supported by the National Key Research and Development Program of China (2017YFB0803304) and the National Natural Science Foundation of China (No. 61772082, U1836206, 61702296, 61806020, 61375058).